When Plus Size Maxi Dresses came on the scene a few seasons ago, I figured the trend would be short lived. Much to my surprise they stayed and are becoming more and more popular. There is a great selection in a variety of styles - everything from casual to dressy. There also seems to be a little loosening in the definition - I noticed that retailers are calling almost all longer length dresses Maxis - so you want to pay attention of you are looking for floor length, ankle length or lower calf length. Of course your height depends on the ultimate length for you. As maxi dresses have gained popularity, they are now suitable for any occasion - from grocery shopping to summer pool parties to weddings and special occasions. The things about maxi dresses, maybe even more so than other articles of clothing, is that they can make you look fabulous or they can be much less than flattering. It all depends on your body type and the style of the dress. This is an example of what not to do! It looks more like a Mo-Mo than a dress. It is just big and wide and it will make you look bigger. This style is very comfortable and is fine for lounging around the house, but avoid it if you want to look your best. This is a great style if you have a pear shape of if your body is balanced. On pear shaped ladies, the top shows off your best body parts and the empire waist hits at the smallest part of your body. If you are pear shaped, look for empire waists and A-line skirts. While you want the skirt to be flowing and lovely, avoid fullness and choose a skirt that just skims over your body. (By the way, I have a pear shaped body and I have this dress in black and in brown. It is probably the most flattering piece of clothing that I own.) This will not be your best look if you are more of an apple shape. Most of your weight is above your waist and this will just call attention to it. A strapless dress is a nice look for a balanced figure (same size on top and bottom) and also pear shapes. If you like the look of your upper arms and chest, you will love this look. Again, an empire waist with an A-line skirt will usually be the most flattering. I love strapless dresses (and tops) with the smocked bodice (think tube tops) because it ensures a perfect, secure and comfortable fit. If you have a large bust line, this will not be your best look. If you have large breasts and want to show off the girls a bit without having to get them their own zip code, go for a v-neck or halter style. Also a wider strap or halter style will be a much better look for you. If you are larger through the middle, the A-line cut will also work for you. This dress also shows another great tip to maximize your upper body, with the black bodice and print skirt. Prints can be fun and make a really great casual dress. Go for colorful prints with a larger scale. Avoid Plus Size Maxi Dresses with horizontal stripes or any print with a horizontal pattern - look how unflattering it is on this "plus size model" - who is probably about a size 12 - you see nothing but bulk through the mid-section and it is just unflattering from top to bottom. To complete your look, don't forget accessories. If you are going casual, go for strappy or chunky sandals and add at least one chunky accessory - either a necklace, earrings or bracelet. Don't overdo it - but one or two bold accessory pieces will make your outfit. If you are going dressier, go with heels and dressier jewelry - like pearls or rhinestones. When you're looking for a reasonably priced fashion dress, a plus size maxi dress might just fit the bill. These dresses were made specifically to fit women of various figures easily, while still giving them a clean line and look. Better still, more stores both online and at your local mall are carrying maxi dresses in a wide variety of styles and colors. 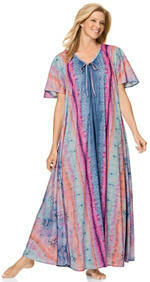 Over the last 40 years maxi dresses have held their own in the fashion industry. Celebrities have worn them at numerous "red carpet" affairs, giving them even more attention with consumers. When you try on a dress like this, one thing you'll notice immediately is the comfort they afford, which is one of the big reasons for the plus size maxi dress' popularity. You can get fancy and feel cozy all at the same time! For ladies who live in hotter environments, the maxi dress keeps you cool because it doesn't cling, and you can often buy them in natural fabrics like cotton that breathe! There are some simple tips you can use to choose the best plus size maxi dresses for your body type. Short women look best in shorter maxi dress styles. Tall women can really get a flattering look from a longer dress. As with other plus size clothing it's wise to veer clear of big, bold patterns. A plain dress can be added to easily by using accessories, which also finish whatever look you were intending to achieve. A plain maxi dress also has more versatility in terms of the types of occasions at which you can wear it. If you desperately want patterns, keep them tiny and potentially match them to the seasons, like a small floral print dress with short sleeves for spring. You won't need as many accessories with the patterned maxi dress. A nice choice of shoes, however, never hurts as the line of this style dress naturally draws people's eyes downward. Women with broad shoulders should steer clear of any plus size maxi dress that has spaghetti straps, while women with pear-shaped bodies typically look great in that style. For the apple shaped body think empire lines. Women who have developed "wing" arms will want a comfortable fitting sleeve on their dress, minimally to the elbow. Sometimes you just have to get out there and dry on a variety of dresses until you find the fit, style, color and line that really accentuates the positive. Once you have that information, it's much easier to buy new maxi dresses anywhere you wish. No matter what reasons exist for you needing plus size clothing - a plus size maxi dress will work for you. These days there are numerous styles whether you're tall, short, round or pear. So what exactly defines a maxi dress? This particular dress style is one that reaches to at least your ankles, often just brushing the floor. This gives you breathing room and allows fabric to shift and sway without clinging. Having said that, fit still matters in a maxi dress. If you get one that's too baggy it will look like you're trying to hide yourself. There is no reason to be ashamed of your curves, just dress them properly and shine with pride. Besides the fit you want to look at other design elements potential plus size maxi dresses. V necks, for example, look very nice on women with longer necks where as a square neckline flatters shorter necks. Mind you if modesty is more your style opt for either a square or rounded neckline instead of the V. Strapless styles draw attention to a pretty bust line while a belted, high wasted dress provides the hourglass figure illusion. For women slight in stature look for an A frame dress - especially one with a belt to offset your shorter lines. A V neck helps this too as do high heels. If the occasion is on the more formal side, instead of bland black or brown - how about amethyst? What about prints and color choices? Again, you'll have plenty from which to choose which actually can prove frustrating. What looks great on the hanger may hang all wrong on you. As a general rule of thumb big patterns are more casual and playful while smaller ones suit romance and formality. 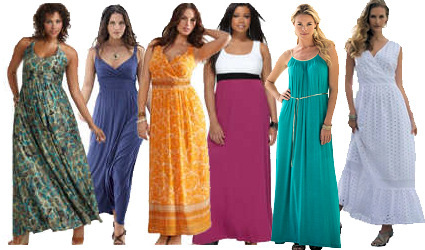 When going casual pair your plus size maxi dresses with large bags, scarves, big pieces of jewelry and sandals. For a little more formality and warmth, top your maxi dress with a well-fitted jacket. Oh, and don't think that your maxi dress isn't functional for special occasions. As with many other plus dress clothes, it's all in how you wear it. A dress without frills speaks of lunch or picnics while one with tasteful jewelry, small pumps and a smart handbag becomes far dressier. What's really most important here is not only how you look in your maxi dress, but also how you feel. You want comfort with class and when you find both - nab it! 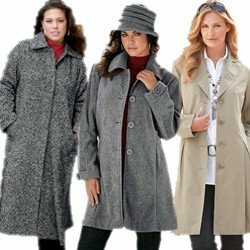 Visit Suzanne @ Trendy Plus Size Clothes's profile on Pinterest.